Tuna casserole is a budget-friendly dish, and it makes a satisfying family meal. This version is extra-easy because the sauce is made with canned condensed soup. I use two cans of tuna in a tuna casserole or a large (12-ounce) can. 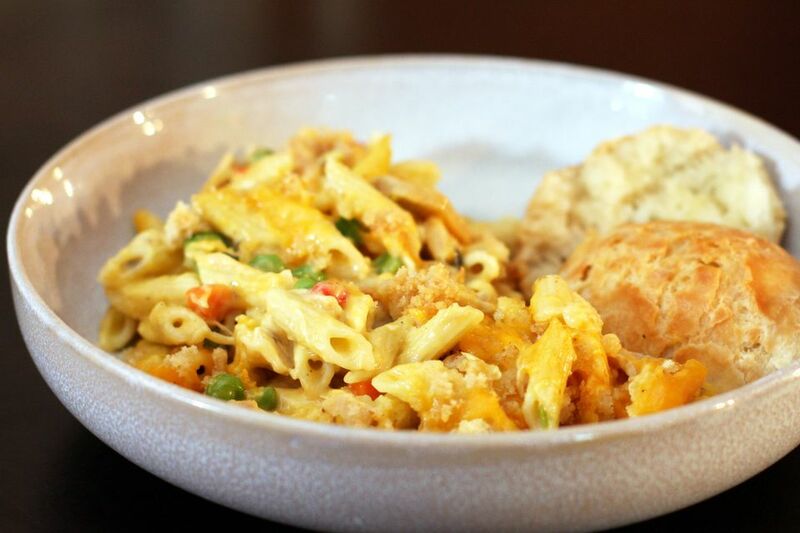 Serve this flavorful tuna casserole with biscuits and a tossed salad for a family-pleasing everyday meal. I used mini penne pasta in the tuna casserole (pictured), but elbows, shells, or another similar pasta may be used as well. Lightly grease a 3-quart baking dish or spray it with nonstick cooking spray. Cook the pasta in boiling salted water following package directions. Drain in a colander. In a large bowl, combine the pasta with the drained flaked tuna, soups, milk, mushrooms, pepper, and drained cooked peas. Gently stir in 1 cup of the cheese. Turn into the prepared baking dish. Top with the remaining cheese. Toss the bread crumbs with melted butter until thoroughly coated; sprinkle them evenly over the cheese layer. Bake the tuna casserole for about 25 to 30 minutes, or until the topping is browned and the edges are bubbly.